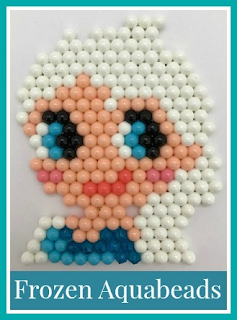 I am an Aquabeads blogger, and I was recently sent a new Aquabeads set to try out with the children - the Aquabeads Frozen Playset (affiliate link). This set contains the beads to make six different Frozen designs and comes with a snowflake themed bead tray to store the beads and keep them easily accessible. Among the beads are several different colours of jewelled beads for some extra sparkle. The set contains one square layout tray, two double sided design sheets, a bead dropper tool, spray bottle, enough beads to complete the designs, and a snowflake themed storage box with a lid that you can also use as a base when creating your design and to prop up your design for drying. To make your designs, you insert the design sheet into the back of the layout tray and make sure that it is all lined up correctly. Then you place the beads into the dimples on the layout tray, copying the design underneath. You can either use your fingers or you can use the bead dropper tool provided which gives you a bit more precision with the placement. The beads come packaged in individual little bags which you can empty into the storage box to keep the colours separate. There are not very many extra beads, and in many cases you only receive just the right number of beads to complete the designs, so you need to be careful not to drop any as you go along or else you won't have enough (there aren't as many as it shows on the box). 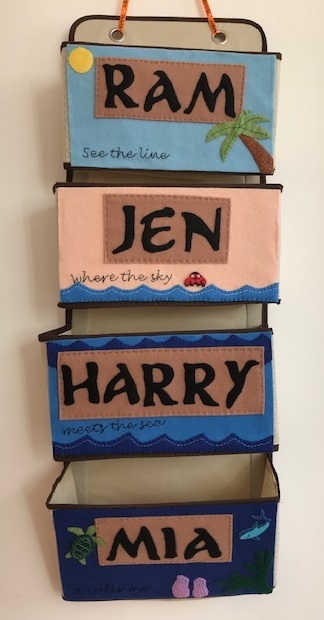 In this particular set some of the colours are quite similar and it wasn't always obvious from the template which one to use, so you need to make sure that you are using the right colour for each part of the design. Placing the beads on the tray is easy, but if you put one in the wrong dimple it is very difficult to correct it as you can easily end up nudging lots of beads into the wrong position. This means that you then you can't see the template underneath to correct it, so I found myself several times rescuing the children's designs by referring to the pictures on the box. When your design is finished you need to spray it liberally with water and then leave to dry for a couple of hours. This part is great because even little ones can do it by themselves. The lid of the box has a groove in it that you can use to rest the template tray in while it dries. (Please note that in the photograph below we are using a second layout tray for Olaf that we had left over from a previous set to work on two designs at once, this set only comes with the one tray). After a couple of hours you can remove the design from the tray and turn it over to spray on the back. The finished project will be dry in another couple of hours but will still be quite soft, if you wait a few days it will harden up completely and feel much more sturdy. I loved the finished designs, the colours work really well together and the jewelled beads really do make them sparkle. There weren't many beads left at the end, but the storage container is really useful if you have beads left over from other kits like the 3D Animal Refill Kit that I also reviewed recently. I found that the children (they are aged 5 and 7) did need quite a bit of help when completing these Aquabeads projects, but they made a really nice finished product which is fun and colourful. I was sent this product in exchange for a review. Amazon link is affiliate.